Mitch McConnell: IRS scandal can't be tied to Obama. 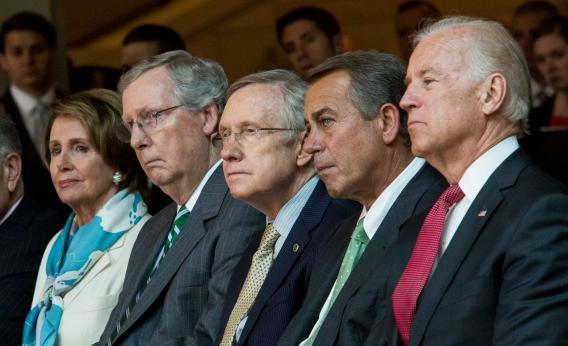 House Minority Leader Nancy Pelosi, Senate Minority Leader Mitch McConnell, Senate Majority Leader Harry Reid, House Speaker John Boehner, and Vice President Joe Biden look on during a dedication ceremony for the new Frederick Douglass statue at the U.S. Capitol on June 19, 2013. Brian Beutler reports from Mitch McConnell’s speech to AEI, and quotes a line about the endless IRS scandal that wasn’t in his prepared remarks. There might be some folks out there waiting for a hand signed memo from President Obama to Lois Lerner to turn up. Do not hold your breath. Finally, it’s catching on. Some conservatives, starting with Rep. Raul Labrador, have cautioned their comrades from hoping that the IRS story will find a direct Obama link, a smoking gun. The debate is over whether to expand the critique to cover the growth of liberal bureaucracy, not Obama; or whether Obama uses mental powers to encourage the bureaucrats to sic his enemies. That’s basically the Peggy Noonan argument: “Nobody imagines the White House picked up a phone to tell IRS workers in Cincinnati to target their enemies. That, as they say, is not how it’s done.” It’s an undebunkable argument! Bonus feature: McConnell slapping around AEI’s resident moderate conservative Norm Ornstein, and Ornstein responding by trapping McConnell in his contradictions.